We are going to work with OllyDbg v1.10. You can download this awesome tool from here: OllyDbg v1.10. You can see its details in the picture below. The first thing I usually do in these cases is to check if the executable is compressed or not. Some programs pack some of their codes in order to limit our attempt to statically analyze it. To achieve this purpose we are going to use PeID. 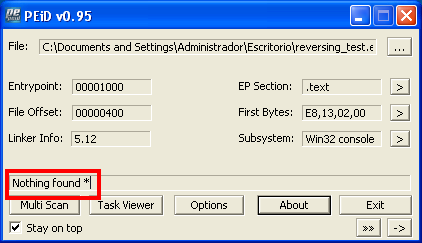 In the picture below you can see that the program does not detect any compression "Nothing found *". If the file were compressed with UPX for example, the program would advise us about it and we could uncompress it with this tool. If we click on the "EP Section" bottom, we will see some executable's details. We can see the R. Size (Raw Size) "400" and the V.Size (Virtual Size) "350" are similar in ".text" . 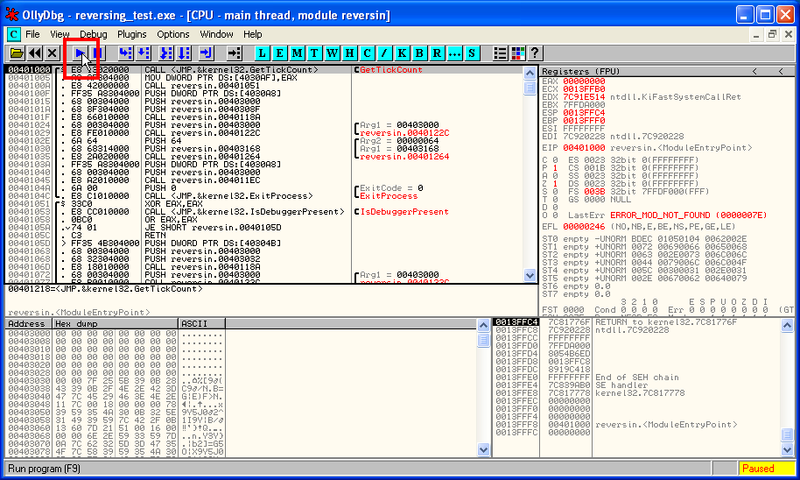 The .text section contains the instructions that the CPU executes and it should be the only section that includes the code. If some day you detect that the R.Size is "0" and the V.Size is "1000" for example, it would be an indicator that the executable is compressed because in the disk it does not have any size (it is packed) and in the memory it has a size (it is unpacked itself). The next step would be to run the program by double clicking on the executable. After that, we can see that a MS-DOS window is launched and the program requires us to type the serial number. We type a sentence in order to check the program's behavior. Now, we are going to run OllyDbg. It does not need installation, just download it and uncompress it. 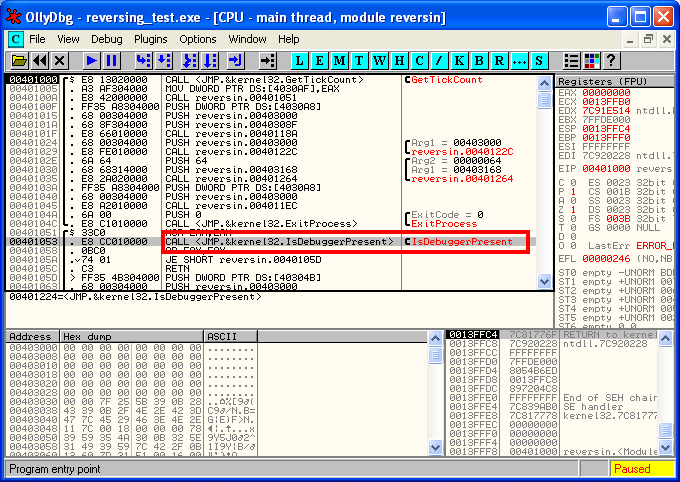 When OllyDbg is opened, just load the executable clicking on File -> Open. Now we can see the binary code. Don't worry, remember this post is focused on beginners. We are going to click on the play button in order to run the executable just loaded in our debugger and check the file behaviour. If we reload the file again on OllyDbg, one line of the code draws our attention... The program is calling to the "IsDebuggerPresent" API. If we seek this API on Microsoft we can see that "This function allows an application to determine whether or not it is being debugged, so that it can modify its behavior". Ok, the program is closed when it is open within a debugger. There are many options to avoid being detected by this technique... To achieve this purpose we are going to use the "Hide Debugger 1.2.4" plugin. Just download it and uncompress the DLL in the same OllyDbg's folder. It is necessary to restart OllyDbg in order to work with this plugin. If you click on Plugins tab you can see Hide Debugger plugin. You don't need to do anything else. We are going to type a sentence which will be easily recognizable. If we come back to OllyDbg we can see our sentence in the Arg1. If we continue looking for this sentence through the code we can locate the code below. We can see the String2="28939387", the String1="I'm going to looking for this sentence in OllyDbg now..." and the API call CompareStringA. We can figure out that the executable is comparing these strings to each other in order for you to check if both have the same value. We can suppose that the string "28939387" is serial number. OllyDbg offers us to copy the value of this line by left clicking on the line we are interested in. Then, we are going to paste the line's value to the notepad and then, we are going to copy only the "String2" value: 28939387. In the end, we just need to try paste the value just copied in our program and... Well!!! We have obtained the serial number of our program!!! This post could be applied to many of the simple programs which have a keygen integrated but it is needed to have more knowledge if you want to crack more complex programs. Can your give us the software to practice that? can you give the link of reversing_test.exe ? 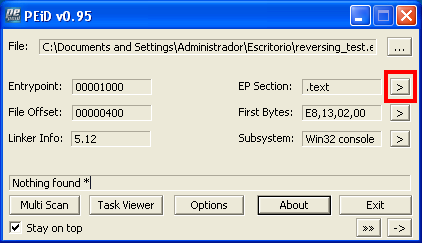 How can I get the reversing_test.exe? Can you send it to me? thank you. I like your Blog and there aren't many good blogs. But maybe you can show, how to bypass an CD/DVD Check. Perhaps from Age of Empires 2? Yes I know. And i want to learn Reserve Enginnering. I had Age of Empires 2 bought legal. Its just for the learn effect. Hi. I guess nobody bothered to try it out since nobody requested you the reversing_test.exe. Can you kindly share the same? Sorry but I lost the file... But you could try whit this one!! !